And God said, Let there be lights in the firmament of the heaven, to divide the day from the night; and let them be for signs, and for seasons and for days, and years. And let them be lights in the firmament of the heaven, to give light upon the earth; and it was so. And God made two great lights; the greater light to rule the day, and the lesser light to rule the night; He made the stars also. And God set them in the firmament of the heaven, to give light upon the earth and to rule over the day and over the night, and to divide the light from the darkness; and God saw that it was good. And the evening and the morning were into the fourth day. And God created great whales, and every living creature that moveth, which the waters brought abundantly, after their kind, and every winged fowl after his kind; and God saw that it was good. And God blessed them, saying, Be fruiful, and multiply, and fill the waters in the seas; and let fowl multiply in the earth. Thus the heavens and he earth were finished, and all the host of them. 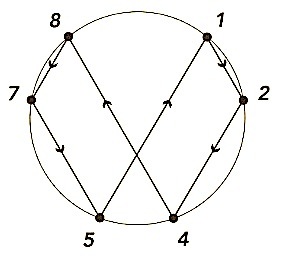 [The logic of the pre-heaven and the post-heaven octagons were finished and encoded in the thought octagon, and thus the logic component of Matter-Being was created and encoded in the computer. He put them inside the Base-9 world and into the logic set of the number 9 and waited for the entanglements to self-create within its members. Within the Base-9 world of numbers, the logic of motion is created in the Gnomonic expansion—contraction—spiral Holon. And within the logic of motion, Base-10 plus space and the physical constants are created. The first series is related to the Music of the Sphere and to Gurdjieff’s Enneagram. And on the seventh day God ended his work, which he had made; and He rested on the seventh day from all his work which he had made.